For the past seven years, Border Collie Mij, who has been referred to as a “real-life Lassie,” has spent her days keeping Britain just a little bit safer. As the United Kingdom’s top certified search-and-rescue dog, Mij has led more than 200 missions in her illustrious career, using her remarkable nose to seek out missing persons in some of the most baffling cases. But at the ripe age of 10, the time has come for the old girl to hang up her leash. Mij, known as the most successful and dependable dog on the British Isles, is ready to enjoy her retirement. As Mij gets ready to enjoy the lazy life, those who know and love her are reflecting back on all of her amazing accomplishments. 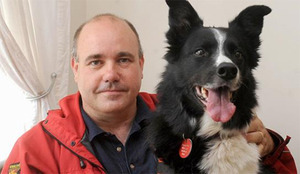 When Mij was just a pup, the now-expert Collie suffered from stamina-killing health problems that might have made any other dog a less-than-perfect candidate for open area search-and-rescue. Traditionally, search-and-rescue canine trainees are taught to scan a large area; Mij’s condition seriously hindered her from covering such a wide zone. But Mij was special from the start, and her owner and trainer couldn’t help but fall in love with the sweet black and white puppy. Seeing her potential, he decided to try a new narrow scent discrimination technique to train little Mij in search-and-rescue, and Mij proved she was worth the effort. The new methods not only gave Mij a second chance at search-and-rescue — it allowed Mij to tackle the toughest cases, to excel when all other rescue efforts had failed. Using her super sniffer with striking accuracy, Mij has found and saved 14 people over the course of her career, more than any other canine in all of Britain. Chairman of the National Search and Rescue Dog Association (NSRDA) Harold Burrows says Mij has forever changed the way search-and-rescue canines are prepped for duty. One of Mij’s most crucial rescues was that of an elderly woman who’d been missing from her home for over 24 hours. Though a team of 100 had searched far and wide, they had no luck in finding the missing woman. That’s when authorities called Nicholson — they needed Mij. When Mij arrived on the scene, all it took was a quick sniff of one of the woman’s clothing items and the search-and-rescue star was off and hunting. Within mere moments, Mij had not only traced the missing woman’s path — she actually found the missing woman, who’d fallen into the shrubbery and was completely hidden from view. NSRDA rep Paul Durham says that though Mij is retiring, her legacy will live on in the 20 dogs currently training in the narrow scent discrimination methods Mij pioneered during her distinguished career. But as the next generation of search-and-rescue canines gets ready to take the reins, Durham knows the new pups on the block have some big shoes — or rather, paws — to fill.